The International Masters in Economy, State and Society (IMESS) is a leading two-year double degree Master’s programme in comparative area studies, which focuses on developing in-depth knowledge and understanding of Central, Eastern and South-Eastern Europe, the Baltics, Russia, the Caucasus and Central Asia. Each track combines specialist electives (economics, politics, society or history), research methods training (social sciences or humanities), and language tuition with an advanced research dissertation conducted during the latter part of the degree. The central objective of the programme is to enhance global understanding and awareness of the wider European region. As well as developing cultural and linguistic knowledge of both Eastern and Western Europe, participants acquire the skills to identify and critically analyse key factors shaping the economies, states and societies of the expanding European region. The IMESS programme is a two-year integrated Masters programme in which all students spend year one at UCL in London, where they develop expertise in the methodologies (econometrics), theories and applications of Economics and Business and have the opportunity to learn or improve a language. 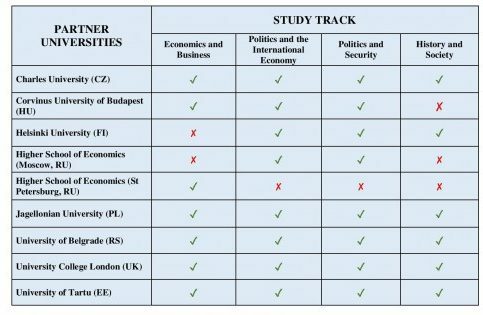 In the second year, the students will move on to the Corvinus University of Budapest (or other partner universities) where they will have the opportunity to choose from the following 3 tracks: Economics and Business, Politics and the International Economy, Politics and Security.